Below the sign $ to $$$$$ are links to article in the press. $ : little importance $$$$$ : a must read! The mystery shaking at Clintonville has finally been solved. 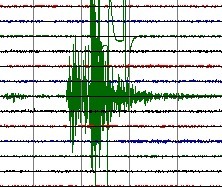 A swarm of minor earthquakes caused the shaking. The Pacific Ocean currents needed exactly 1 year and 14 days to float a 54 meter Hokkaido fishing ship, swept into the ocean on March 11 2011, to arrive 140 NM (Nautical miles) from the Southern tip of Haida Gwaii. The ship could miraculously stay afloat (it survived storms without any people on board) . This will certainly be a tremendous study object for scientists. It is believed that as many as 5 million tonnes of debris were swept into the ocean during the Japan Tohoku tsunami. Based on what we see now, Canada may expect to harvest some of it !